Colwyn Bay Heritage Group is pleased to acknowledge the help it has received from a number of organisations , including Communities First, Bay Life + , The Welsh Heritage Lottery Fund, Theatr Colwyn, Colwyn Bay Civic Society and Conwy County Borough Council, particularly through the staff and facilities of Colwyn Bay Library. 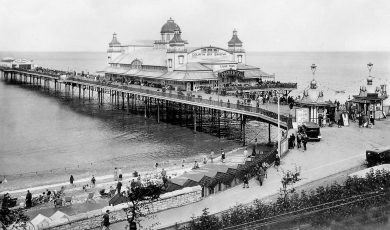 Colwyn Bay Heritage Group would like to acknowledge the grant and the support received from the Heritage Lottery Fund, which has made it possible for the group to undertake its varied projects, including this website, relating to the history and heritage of the town. Built in 1905 Colwyn Bay Library is one of Conwy’s oldest and grandest libraries. The Library was built by local subscription with support from philanthropist Andrew Carnegie and has been part of the life of the town for over a century. It stocks approximately 42,000 books and has 21 PCs for free access to the Internet and also free Wireless access. Staff are able to help with local history enquiries using the extensive browseable collection of local history books, newspaper articles and old photographs. The Library is a designated Archives Access Point providing access to the North Wales Weekly News (back to the 1890s), parish registers, ordnance survey maps and trade directories for the area. For Family History researchers the Library also provides free access to the Ancestry and Find My Past websites. For more information contact the Library on 01492 577510 or see the details at the web page below. 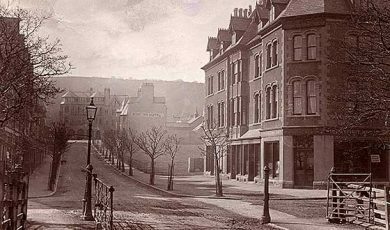 The Colwyn Bay Townscape Heritage Initiative (THI) is a five year programme of heritage led regeneration funded by the Heritage Lottery Fund (HLF), Welsh Government, Conwy County Borough Council and Cadw. The aim of the HLF programme is to conserve, enhance and regenerate conservation areas suffering from economic decline. The project will run from 2012-2017 and is part of the wider Bay Life suite of regeneration initiatives for the Colwyn Bay area and waterfront. The parts of Colwyn Bay’s Glyn and Rhiw Wards, from Eirias Park to the West End have been designated a Communities First Area. Communities First is the Welsh Government’s flagship programme to improve the living conditions across Wales. The aim is to work with local people to enable them to play an active part in their communities. There is a Communities First Partnership which is made up of community representatives, the voluntary sector, business sector and statutory organisations. They work together with the Communities First team to develop a range of local projects under various themes from Health and Wellbeing to Education and Training. If you would like more information visit Communities First at the Bay Learning Centre, 47 Conway Road, Colwyn Bay or call 01492 531996. There’s something exciting going on in Colwyn Bay. The Bay Life+ regeneration project is underway to transform the town into the great place we know it can be. Work has already begun, and soon you’ll be able to see the project really coming together. attractions and a major leisure complex. By adding to these we can help ensure Colwyn Bay has a brighter future. Already Bay Life+ has brought together over 30 community groups, hundreds of businesses and countless individuals through numerous consultation days and events. Theatr Colwyn was built in 1885 and is the oldest working cinema in the UK and both the oldest civic theatre in Wales and the oldest working theatre in Wales. For more information contact the theatre on 01492 577888 or see the website. The Civic Society has a watching brief over the town and seeks to protect the town’s natural and built heritage. It is a consultee on planning applications in the Colwyn Bay area, campaigns for the protection of Colwyn Bay’s built heritage and seeks to influence opinion in favour of good planning practice.